Robert Hansen Landscaping, LLC has been creating beautiful Hardscapes in Weston, Westport, New Canaan, Shelton, Trumbull, Fairfield, Woodbridge, Monroe, and surrounding areas for over 30 years. Installing hardscapes such as paver patios and walkways, retaining walls, driveways, and fire pits is a great way to enjoy spaces on your property that were previously unusable! A properly installed paver patio in your back yard is a great space for entertaining or just sitting and relaxing. It all starts with a properly installed base! After one harsh New England winter, a poorly installed base will allow your walkway to settle, sink, and shift; causing you to spend much more to repair it than if it had been done correctly from the start. It pays to do the work right, the first time! This is where our company stands out compared to others. On our projects, depending on the job, up to 80% of the work performed might be dedicated to creating a great base. Make sure to research and interview the contractors you choose to do installations, because in most cases it will save you money to pay a little extra for a properly licensed, qualified, insured, and respected company. 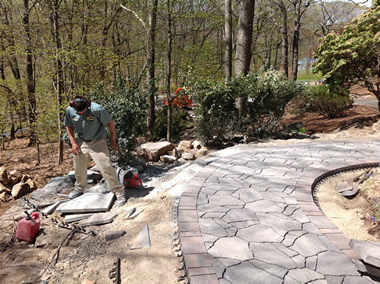 Our hardscape installations are made to withstand years of abuse, so please ask us for references! We pride ourselves on legendary customer service, so we will always be available to answer any questions or concerns you may have! Call Robert Hansen Landscaping, LLC at 203-924-6933 today! The first step to a new landscape or hardscape installation should be creating a landscape design. We will meet with clients to help us learn about their goals and what their likes and dislikes are! After an initial meeting, if we plan to move forward, we will take measurements and elevations if necessary, and then work to create a beautiful landscape design. This is a great way to visualize your project, and if needed, break it down into phases and priorities! Concrete pavers are incredibly durable. They provide a long lasting, non-slip surface with a huge number of colors, patterns, shapes, and sizes. They are designed to withstand our tough New England Winters, and the joints between the pavers allow for a small amount of movement without cracking or damaging! Concrete pavers are denser and tougher than concrete. If there is ever a need to fix a small area, it is possible to repair small areas or individual pavers, without leaving a patch or stain like repairing asphalt, concrete, or cement walkways would. The most common use for concrete pavers is a paver patio. Concrete paver patios are durable, long lasting, and beautiful. The options for color, pattern, and design are as wide-ranging as are the different uses for a paver patio! Patios are great for entertaining and can be outfitted with grills, outdoor kitchens, firepits, patio furniture, or even a beautiful Gazebo! The possibilities are unlimited! Integrating a patio with a landscape planting can create an oasis right in your own back yard! Paver walkways are a great way to increase the curb appeal to your home through both beauty and function. Installing a straight walk from your front door to your mailbox or a curved walk to your driveway can frame the landscape planting in front of your home. A properly installed walkway will transition your landscape from one area to another, and ensure years of heavy use and enjoyment. Paver walkways for commercial buildings increase the curb appeal of your business, and shows that you take pride in the appearance of your place of business. Paver walkways will withstand your customers’ heavy traffic! Front landings made of pavers also create an extremely inviting and beautiful entrance to your business! Concrete pavers are much denser and stronger than concrete, and won’t crack over time like asphalt! In combination with a properly installed base, a paver driveway can last for many years. We have installed large paver driveways and parking lots for commercial buildings that have a constant flow of tractor trailers and delivery trucks. They are holding up incredibly well, even years later! The first thing guests notice is your driveway! Why not have a driveway that looks like a work of art and is stronger than the road you drove on to get there! With many different patterns and color options, your driveway can be beautifully designed to compliment your home and landscape! Permeable pavers are an eco-friendly alternative to paving! Permeable paver patios allow excess storm water to infiltrate down, lessening the amount that enters the sewer down the street! Turf pavers are another great way to allow for storm water infiltration! Gravel driveways can be a cost effective alternative to paving. With many different decorative gravel options, you can add a beautiful accent to your home. Combine a gravel driveway with a Belgian block apron or curbing to create a beautiful entrance and desirable curb appeal. Fire pits are the ultimate New England outdoor accessory! Including a fire pit with a paver patio is a great way to extend your outdoor entertainment season! Enjoy it from early spring into late fall or even early winter, and let it keep you warm and happy! A very distinctive colored stone, Bluestone walkways and patios can add a subtle beauty to your landscape. Thermal cut bluestone offers a smooth, uniform patio surface which is great for walking on with bare feet, while natural bluestone provides some more irregularities in color and texture creating a more traditional look. 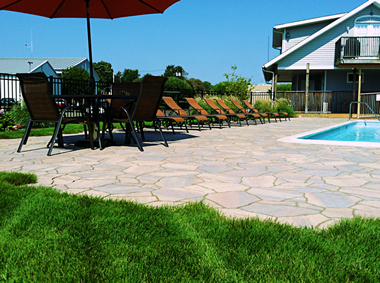 Using pavers around a pool is an ideal way to put a gorgeous finishing touch on your outdoor entertainment area! Pavers are durable, no-slip surface alternative to rough concrete! We can help you choose the right pavers to help accentuate your pool, house, and landscape! Pavers can turn a boring concrete patio into an inviting outdoor oasis! If you have a damaged or shifting patio or walkway, we can help. Often times paver patios that are moving or sinking have an improperly installed base, drainage issues, or can even be missing edge restraints. We can help identify the problem and repair your patio. Sometimes patio repair can be a simple process of lifting certain paver blocks to reset them, other times a new base or edging must be installed. We can also reinstall polymeric sand or stone dust! Sometimes all your patio needs is a good pressure washing, paver cleaner, or paver sealer to look like new again! Retaining walls can be one of the most important aspects of a new landscape installation. They turn unusable slopes into functional lawns, patios, and planting beds. A correctly installed retaining wall will last a very long time! Retaining walls can be long and straight, or have beautiful meandering curves to create a nice flow throughout your property. Retaining walls help solve elevation issues, create planting borders, or can even create beautiful sitting areas. There is something calming about sitting near water. Our custom water features are a peaceful focal point of any landscape! Whether you choose a Koi Pond, a pond-less-waterfall, or a combination of a beautiful waterfall that gently flows into a pond, it will certainly be the talk of your guests! There is nothing more relaxing than lounging in your back yard listening to your very own waterfall!